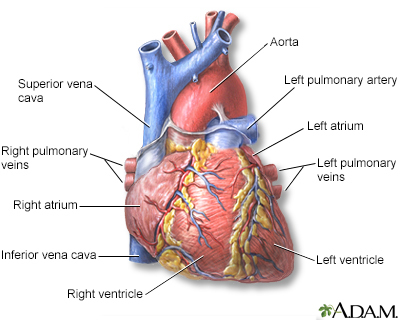 Right heart ventricular angiography is a study that images the right chambers (atrium and ventricle) of the heart. You will get a mild sedative 30 minutes before the procedure. A cardiologist will cleanse the site and numb the area with a local anesthetic. Then a catheter will be inserted into a vein in your neck, arm, or groin. The catheter will be moved into the right side of the heart. As the catheter is advanced, the doctor can record pressures from the right atrium and right ventricle. 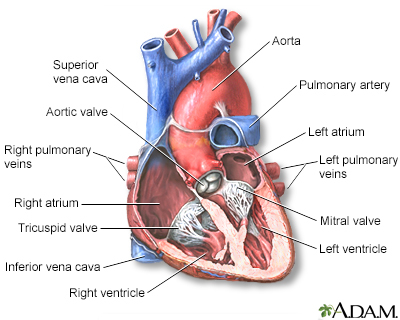 Contrast material ("dye") is injected into the right side of the heart. It helps the cardiologist determine the size and shape of the heart's chambers and evaluate their function as well as the function of the tricuspid and pulmonary valves. The procedure will last from 1 to several hours. You will not be allowed to eat or drink for 6 to 8 hours before the test. The procedure takes place in the hospital. Generally, you will be admitted the morning of the procedure. However, you may need to be admitted the night before. A health care provider will explain the procedure and its risks. You must sign a consent form. You will be given local anesthesia where the catheter is inserted. Afterward, the only thing you should feel is pressure at the site. You will not feel the catheter as it is moved through your veins into the right side of the heart. You may feel a flushing sensation or the feeling that you need to urinate as the dye is injected. Right heart angiography is performed to assess the blood flow through the right side of the heart. This test may be combined with coronary angiography and left heart catheterization. Arshi A, Sanchez C, Yakubov S. Valvular heart disease. In: Kellerman RD, Rakel DP, eds. Conn's Current Therapy 2019. Philadelphia, PA: Elsevier; 2019:156-161. Herrmann J. Cardiac catheterization. In: Zipes DP, Libby P, Bonow RO, Mann DL, Tomaselli GF, Braunwald E, eds. Braunwald's Heart Disease: A Textbook of Cardiovascular Medicine. 11th ed. Philadelphia, PA: Elsevier; 2019:chap 19. Udelson JE, Dilsizian V, Bonow RO. Nuclear cardiology. In: Zipes DP, Libby P, Bonow RO, Mann DL, Tomaselli GF, Braunwald E, eds. Braunwald's Heart Disease: A Textbook of Cardiovascular Medicine. 11th ed. Philadelphia, PA: Elsevier; 2019:chap 16.